The inevitable leftovers happen after Thanksgiving or even before. 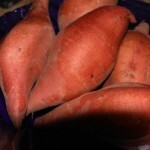 If you make a recipe that calls for an exact measurement of a natural food that comes in its natural form of an inexact measurement like Garnet yams you may even have leftovers before Thanksgiving. Things like baked yam casserole, cranberries, roasted Brussels sprouts can be put to good use in other dishes. One thing I always have left over is ground nuts. A recipe may call for quantities of ground nuts and I have to guess how many whole nuts to grind to achieve the measurement. There is always some left over. For the ground nuts recipe please be patient for the next post. I have a confession to make, in my family we love Thanksgiving so much that on the Friday night after Thanksgiving, we eat the whole feast over again. I roast a fresh turkey on Friday to crisp, juicy perfection. 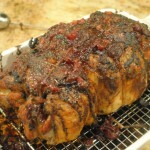 Cranberry sauce can be used for several days. Stuffing, well when I assemble the first one I also assemble a second one to be baked on Friday. Vegetables are easy to steam or roast fresh again on Friday. The only thing missing is an appropriate Challah to turn this into a Shabbat feast. You see where I am going with this, in keeping with an ideal of not wasting food, last night I took some left over baked Garnet yam pulp and created this recipe. The result was visually stunning. 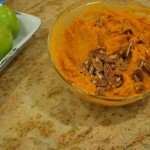 Try this recipe this year for a post Thanksgiving Shabbat dinner. 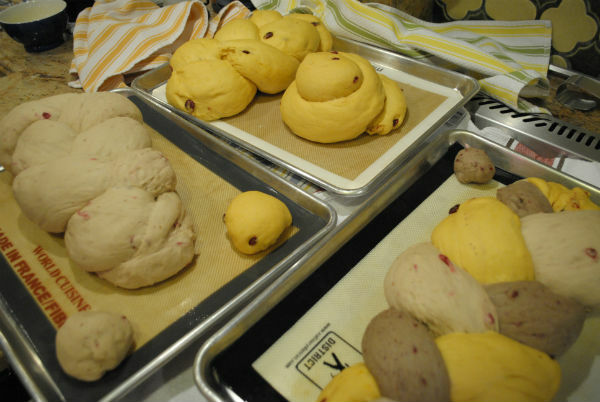 In the pictures you can see I made several batches of dough, one had 1 cup of fresh cranberries and 1/ 2 cup of raspberries instead of yam pulp, and one batch had 1/ 2 cup fresh cranberries plus 1 cup of heated pomegranate juice instead of saffron water. The amount of flour varied a little bit. Take eggs out of the refrigerator and bring to room temperature. Crack eggs and egg yolk and set aside in a small bowl. Place yeast in a medium bowl or I prefer a 2 cup glass measuring pitcher. Add warm water, pinch of saffron and honey to yeast. 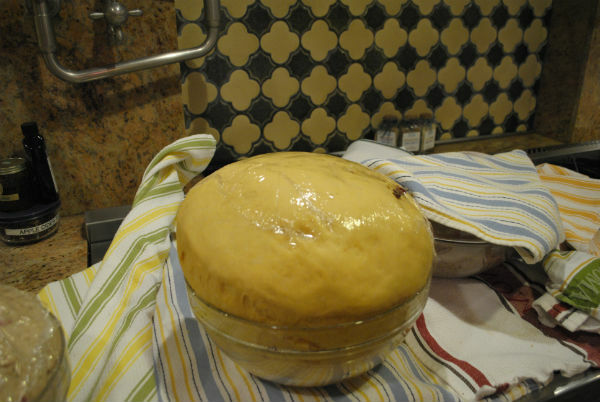 Wait for yeast to proof (begin to bubble and foam) and then, add oil. In the bowl of a stand mixer or in the bowl of an extra large capacity food processor place 4 cups of flour. Add anise and salt to flour. Mix or pulse for a second. 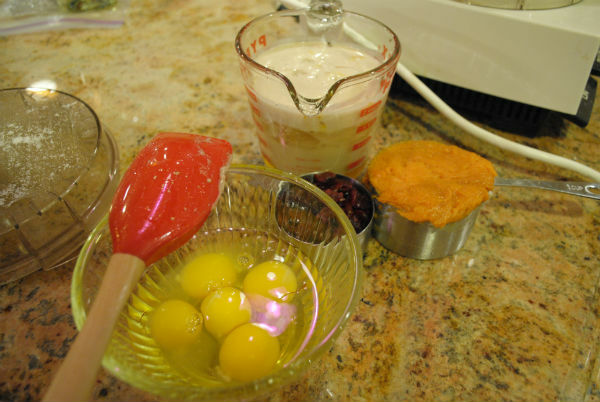 Place yeast liquid, yam pulp, and eggs in flour and process or mix until very smooth and wet. Add an additional 4 cups of flour and mix until a ball of dough forms. Process for 30 seconds or mix in mixer for 2 minutes and then check for texture. 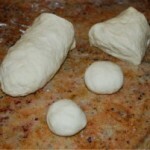 If dough is too wet, add more flour, if dough is soft, elastic and not sticky more flour is not needed. Mix for another 2 minutes or until dough is very smooth. If using a food processor process only for another 30 seconds. Remove dough from mixing bowl. 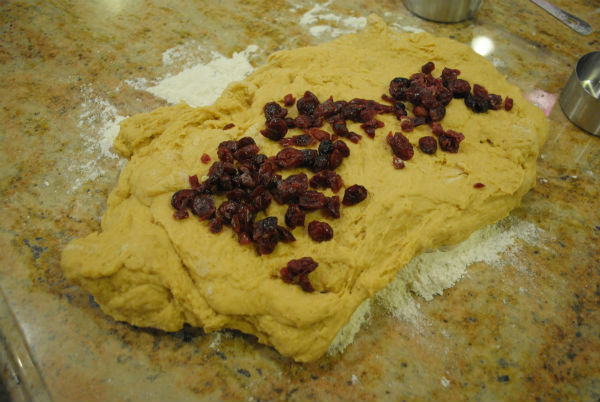 To incorporate dried cranberries, spread dough into a rectangle, place cranberries in center and then, roll it up jelly roll fashion. 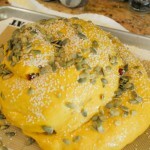 Knead for a bit to distribute cranberries throughout dough and place in a large bowl to rise. Place a tea towel under the bowl, place a small piece of plastic wrap on surface of dough and then, cover with another tea or dish towel. Place in a warm draft free corner to rise. 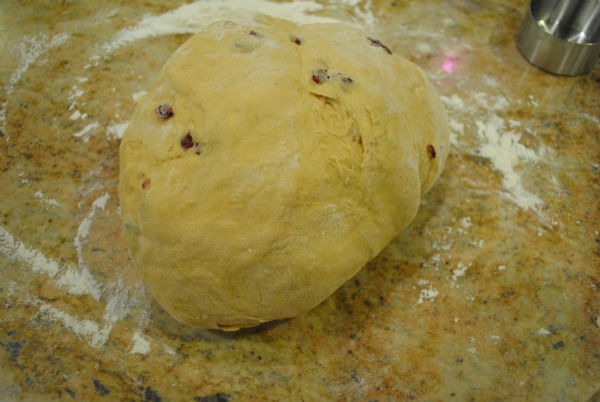 Dough should rise about 1 and 1/ 2 hours to 2 hours. When dough has risen substantially, punch it down; if you wish, take the portion for the blessing, and form breads. 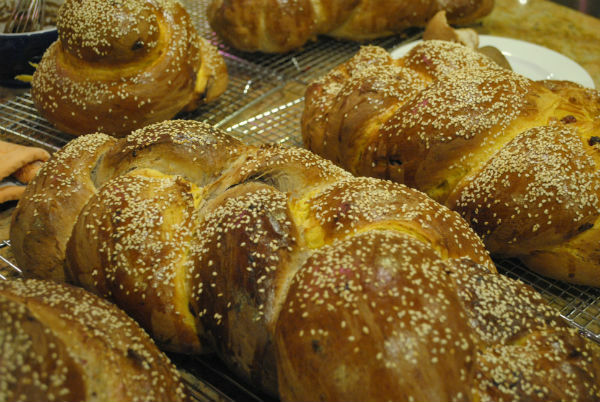 Place formed challahs on baking sheets lined with a silpat or dusted with corn meal. Place a tea towel on top to cover and place baking sheet in a draft free place. Dough will rise again for one hour before baking. Heat oven to 350° F. Place rack in center of the oven. Using a pastry brush, carefully brush beaten egg over bread. Sprinkle sesame seeds over bread and place in the oven. 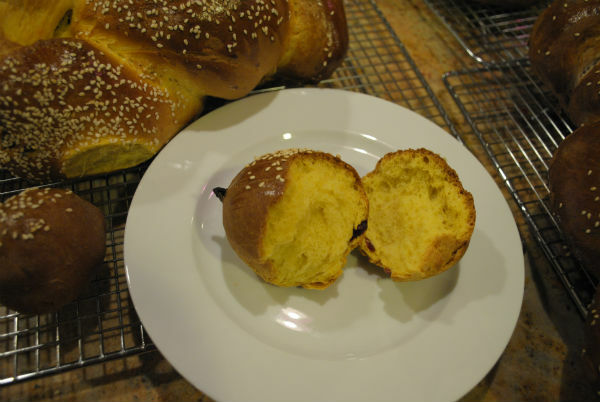 Challah bakes for about 30 minutes or until deep golden brown. Remove from oven and cool on a rack.